Apart from our genes, it’s our lifestyle that determines how fit, healthy and happy we are as we age. The evidence of the health benefits of both aerobic exercise and strength and balance training is overwhelming, in terms of limiting the development of chronic disease, disabling conditions, mental ill-health and in maximising our prospects for long, living happy and independent lives. Silverfit aims to promote healthier ageing, creating the opportunity for new social networks at the same time –healthier, happier ageing. INTRODUCTION - living longer, but what is the quality of life? Fitness matters more than weight? THE MAGIC FORMULA - living longer- but what is the quality of life? b. A new Silverfit lifestyle? 1 WE ARE LIVING LONGER BUT WHAT WILL OUT QUALITY OF LIFE BE? Life expectancy is increasing(1) and there are already 20,500,000 people aged 50+, over a third of the total UK population. In 2010 the median age at death had risen to 82 yrs for a man and 85 for a woman. But the cost to society is rising inexorably, as increasing numbers become dependent for physical, emotional and financial care, a cost the younger generation will pick up. Although people are living longer in the UK, recent research has shown they are spending their later years with more health problems compared to 20 years ago(2). In 2010, muscular-skeletal disorders (mainly lower back pain and falls) and mental and behavioural disorders (predominantly depression, anxiety, drug and alcohol use, schizophrenia, and bipolar disorder) were responsible for more than half of all `years lived with disability`. With the UK ranking only 12th out of 19 countries of similar affluence in 2010, UK residents enjoy fewer years of good health before they die than the citizens of most comparable European countries as well as Australia and Canada. 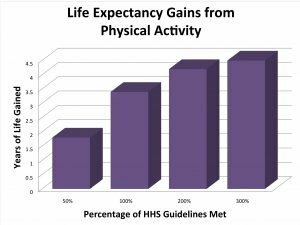 After accounting for other factors that could affect life expectancy, such as socioeconomic status, researchers(3) found that life expectancy was 3.4 years longer for people who reported they got the recommend level of physical activity. People who reported leisure-time physical activity at twice the recommended level gained 4.2 years of life. In general, more physical activity corresponded to longer life expectancy. There is now overwhelming evidence that regular physical activity has important and wide-ranging health benefits. These range from reduced risk of chronic diseases such as heart disease, type 2 diabetes, and some cancers to the enhanced functioning and preservation of functioning with age. There is also strong emerging evidence that activity delays cognitive decline and is good for brain health. Physical inactivity is one of the most important public health problems of the 21st century. Bad diet and physical inactivity account for 14.2% (disability adjusted life years) DALYs in the UK, with high BMI alone accounting for 8.6%. These lifestyles largely cause in the increased rates of cardiovascular diseases and cancers. As people live longer, disability is becoming an ever-bigger social issue. 9.7 million are aged 65 or over. A third of those live alone, with higher risks of loneliness and a lack of family support. Physical inactivity – the biggest public health problem of the 21st century. This graph shows the estimated percent of deaths that could have been avoided if each risk factor had not been there. A large study showed that low cardio-respiratory fitness levels (CRF) contributed to more deaths than other major chronic conditions. So if people with low CRF level had been fit, almost 16% fewer would have died. If smokers had not smoked, 6% fewer would have died. By 2015, 23% of the population will be over 50. Reaching their fifties presents a wide range of challenges to both men and women in their working capacity and home-life, facing retirement, menopause, loss of partners, children, changed lifestyles, living alone, or lacking direction and control over their lives. No amount of physical activity can stop the biological ageing process, or lead to immortality, but regular exercise and strength training can minimise the damaging physiological effects of a sedentary lifestyle by limiting the development and progression of chronic disease, disabling conditions and, crucially, the lack of independent healthy living. Below are some examples of the vast pool of research on the benefits of exercise, not smoking and a healthy diet in reducing obesity and chronic diseases, including Type 2 diabetes, depression and mental health, Alzheimer's and loss of physical functioning, precursors to physical instability and the risk of falls. Type 2 diabetes(4) confers a significantly heightened risk of coronary heart disease and the UK has seen a 74% explosive rise in new cases(5). It is now affecting at least 4% of the general population (18% of over 60’s) with even more individually unaware they have the condition. Type 2 diabetes is linked with obesity and lack of exercise yet physically active people can reduce the risk of developing Type 2 diabetes and strokes by 50%(6). The costs of diabetes and resulting complications account for 10% of the total NHS budget, £14 billion per annum. This takes into account in-patient care, drugs for diabetes and resultant complications, £8.4 billion on absenteeism, and the costs of early retirement and social benefit increases. Less than 3% of older people over-65's exercise regularly, despite the fact that the health benefits remain, even for those who have not taken up exercise or sport until after 50(8). Only 28% of all woman met the CMO recommendation of exercise(9) – the figure for women Over 50’s in the UK is not known. The cost of inactivity has been costed at £ 8.3 billion(10). Physical activity is associated with reduced medical costs, especially for women, and these cost reductions become more significant with increasing ages(11). Obesity, lack of exercise and poor diet contribute to huge long term problems in an ageing population, in terms of quality of life for individuals and costs to society. NHS London estimates that(12) physical inactivity of the Over 50’s costs the NHS in London £105 million/year. 3 FITNESS MATTERS MORE THAN WEIGHT. There is increasing evidence that physical activity is of greater significant than weight in affecting morbidity and mortality. A study(15) followed men with Type 2 diabetes for 16 years, measuring weight, level of cardiorespiratory fitness and whether they died of Cardio vascular disease (CVD) in those 16 years. In all three weight groups the men with the lowest fitness levels were the most likely to die. 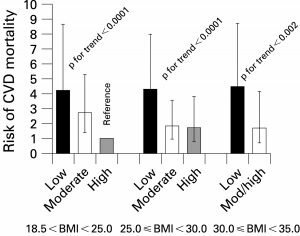 Obese men with high or even moderate fitness levels were much less likely to die than normal weight, unfit men. Lean men who were unfit had twice the risk of death from all causes as did lean men who were fit. In fact, unfit lean men also had higher mortality rates than obese men who were fit. Increasing cardiorespiratory fitness by engaging in regular moderate-intensity activity proved to be beneficial for obese men even if they remain overweight. Significant relationships exist(16) between maintaining cardiovascular fitness levels and the likelihood of becoming dependent on others. Falls, and subsequent falls contribute massively to those risks. Dr. Ladner, the creator of www.fitnessrocks.org www.science2health.org refers to the Magic Formula leading to measurably healthier lifestyles and fitness levels. At SILVERFIT we seek to promote a sixth factor of `social wellbeing` – having fun, developing social networks, belonging in a community. Age UK(17) found that older people said that wanted to exercise more, but only 15% were undertaking 2.5 hours/week. Importantly they preferred to exercise in a group, even when they did not know the other people in the group. 22% wanted to swim! In a study on sociable rats, Leasure(18) describes when female animals were housed alone, their brains did not benefit from exercise as much as when they shared cages. `Socially housed` rats produced copious amounts of new brain cells when they exercised, and the lonely animals did not! A large study(19) of mortality rates over a 24 year time period followed 77,780 nurses in the USA aged 34-59 at the start of the study in 1984. The study looked at exercise, nutrition, no smoking and obesity. They found that those nurses with the first four healthier lifestyles listed above were eight times less at risk of dying from heart disease, 3.4 times less likely to have had cancer, and 4.3 times reduced risk for all causes of mortality. Moreover the benefit of even just one changed healthy lifestyle habit was significant. Another study in 1998(20) looked at 23,000 German participants aged 35-65. Where the first four `magic formula` non-risk factors were incorporated they found seven years later, it prevented 93% of the risk of Type 2 diabetes, 81% of heart disease, 50% less strokes and 36% cancer than participants without any of the four health factors. Similar data was concluded by another study(21) and even if only two non- risk factors were changed, then the risk of type 2 diabetes decreased it by 50%(22). The relative risk of developing and ultimately dying from many chronic diseases including cardiovascular disease, Type2 diabetes and certain cancers does increase with age. The older population also has higher prevalence of degenerative muscular skeletal conditions such as osteoporosis and arthritis. However studies demonstrate a significant decrease in the risk of cardiovascular and death from Type 2 diabetes(24) and other causes amongst those who are moderately fit. This impact of healthy lifestyle is over and above genetic influences(25). a.) Exercise – aerobic and anaerobic. Aerobic ("with oxygen,") activity stimulates the heart rate and breathing to increase so a level of activity can be sustained continuously. Anaerobic "without oxygen" activity can be intense but cannot be maintained for more than a few minutes. Aerobic exercise works in many ways to prevent heart disease; two of the most important are by reducing blood pressure and allowing blood vessels to be more compliant (more compliant means that they become less stiff and it's less likely for fat to accumulate and clog up the vessels). Aerobic exercise can also improve insulin resistance(26). Insulin resistance is a condition in which the body doesn't use insulin properly, and this condition can occur in individuals who do and do not have diabetes. Insulin is a hormone that controls the level of glucose in the blood, but continuous high levels of sugar intake blunt its effect. Many studies have shown the positive effects of exercise on insulin resistance. In one, 28 obese postmenopausal women with type 2 diabetes did aerobic exercise for 16 weeks, three times per week, for 45-60 minutes, and their insulin sensitivity improved by 20%. There is evidence that, independent of dietary changes, aerobic exercise training (cardio exercise of relatively low intensity) can include changes that enhance the body’s ability to maintain glycaemic control and, significantly, use fat instead of carbs as a muscular fuel. Healthy, fit men and women in their 60's retain their capacity to regulate the processes that facilitate their individual metabolic rate and reduction in obesity. A trial of 430 sedentary female patients(27) was divided into four groups, one of no exercise, and the other three rising up to 183 minutes per week. Intensity of the exercise was measured and those women, who for six months undertook 183 mins of stationary bike and treadmills 3-4 times per week had improved fitness levels and improved quality of life in physical and mental terms. Older adults who participate in any amount of physical activity gain some health benefits, including improved physical and cognitive functions. Some physical activity is better than none, but more physical activity provides greater health benefits. Older adults should aim to be active daily. Over a week, activity should add up to at least 150 minutes (2½ hours) of moderate intensity activity in bouts of 10 minutes or more e.g. 30 minutes on at least 5 days a week. Older adults should also undertake physical activity and balance training to improve muscle on at least two days a week. Balance profoundly affects the ability of the individual to be mobile and functionally independent. A number of changes that come with ageing can affect balance. The term “balance” encompasses several different types of control mechanisms for stability including vestibular function (inner ear), visual information, the proprioceptive system, and muscle control. It is using information from muscle receptors and with loss of muscle strength in ageing, then balance is reduced. The cerebellum is involved in both maintaining balance and controlling higher mental functions. As the cerebellum declines with age, then the detrimental effects on a person's sense of balance become a good measure of future mental decline. There is convincing evidence that balance could become the simplest and most reliable way of measuring a person's rate of ageing(30). The vestibular system is connected to centres in the brain that also control our balance. With age, cells in the vestibular system die off, affecting how accurately we detect our position in space. That, in turn, affects our ability to correct our position. Our sight, the ability to focus and see things clearly, diminishes with age. So do depth perception, night vision and sensitivity to contrast. Eye problems can impair, blur or distort vision. The loss of these visual cues compromises balance. Blood pressure can dip suddenly when we stand up, causing dizziness, lightheadedness, blurry vision, even fainting. With loss of muscle mass and strength we also lose power — a function of strength and speed — which affects balance. If we start to trip, power helps us react swiftly. Overall, exercise can help rebuild strength and power, or at least slow the pace of decline. Many health problems can interfere with balance. They include, but are not limited to, arthritis, stroke, Parkinson’s disease and multiple sclerosis. Medications may also increase the risk of falls. And some medications may damage the inner ear, spurring balance disorders. Along with regular aerobic exercise and weight training, balance exercises are vital as we get older. Falls, in an ageing population, represent the greatest cost to the health and care services and arguably the greatest influence on the quality of life of an individual. A third of people over 65 yrs fall each year, representing half of hospital admissions for accidental and particularly hip fractures. Falls are the leading cause of both fatal and nonfatal injuries for people over age 65. Older adults who take fall prevention training seriously reduce their risk for hip fractures, broken bones and head injuries, and increase their chances of maintaining their health and independence. Half of those with hip fractures never return to their former level of functioning and one in five die within three months as a result of the inactivity and, for instance, blood clots. However, despite these grim statistics, half of those given the opportunity to take part in a falls prevention programme drop out, often because they consider fall advice to be only relevant to `older and frailer people`(31). Once they fall, older people become more cautious and further restrict their physical activity level out of fear. Muscles are further weakened, and the risk of falling increases. Exercise in general promotes strength, flexibility and balance. Research evidence confirms that Pilates exercises and Tai Chi can improve balance. The relaxed, flowing movements, low intensity, constant weight-shifting and coordination of the legs and hips make Tai Chi suitable for elderly and frail populations. It is thus vital to encourage exercise sessions for the Over 50’s to improve balance, strengthen muscles and increase bone density- particularly for women who are post-menopausal and at four times greater risk of osteoporosis than men. Exercise increases bone mass if undertaken before menopause and helps to reduce bone loss after menopause. Bone strength increases with regular exercise and weight-bearing exercise works best. Men who ran 9 or more times per month exhibited lower rates of lumbar bone loss than men who jogged less frequently(32). Although lower intensity exercise (walking) is beneficial to bone density, higher intensity exercise will have a more significant effect in post-menopausal women. In terms of cost to the community, they are more likely to be living alone and thus potentially require social care as they become less mobile. Research on strategies to address ageing Londoners indicates that the gap between life expectancy of men and women is narrowing(33). One of the most common injuries for older people is twisting an ankle – an injury that occurs with poor balance. If the ligament is damaged, then the neuro-receptors in the ligaments are damaged, and the brain no longer gets reliable signals, and the proprioception (sense of body’s position in space) is impaired. Individuals become less stable and more prone to falling over again. A solution to poor balance is to practice just standing one leg for 2-3 minutes on a stable or less stable base. Tube surfing – balancing with no hands on the Underground – may offer another opportunity. Balance exercises such as tai chi, Yoga(34) and Nintendo WiFit have also been shown to be effective in increasing balance and reducing the risks of falls that lead to further serious, on-going injuries. 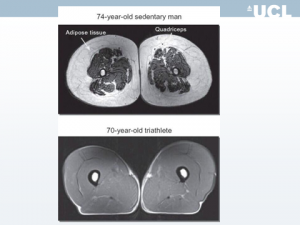 When(35) a group of residents aged 86-96 years did strength training for buttock & quads three times a week, for ten weeks, their strength had increased by 113%, walking speed by 12% and muscle mass by 3%. Strength training for old people can work, and can improve extremely quickly. Strength training has an effect on other structures in the body: it improves the quality of the tissue within these structures and thus increases their load capacity. This applies equally to muscle fibres tendons, cartilage and bone tissues. Muscles are either made up of `endurance fibres` slow twitch which contract slowly or fast twitch fibres which contract quickly and vigorously. Older people need to retain fast twitch fibres to avoid potential falls. Another study of older post-menopausal women(36) found that high-intensity strength training exercises are an effective and feasible means to preserve bone density while improving muscle mass, strength, and balance. NICE(37) recommends strength and balance training for those at risk of falls, with exercises to be individually prescribed and monitored by an appropriately trained professional. Weight training is the best remedy against the loss of joint flexibility(38). There is a paucity of long term studies on the benefits of exercise training for older women. Resistance training of three one-hour sessions per week over 52 week can result in strength change(39) and related bone density changes. Encouragingly, older women were recognised as being `outstanding adherents to exercise programmes`! So, ideally exercise should include aerobic exercise muscle strengthening and flexibility exercises. If women could be attracted to programmes of exercise within a more social context, then there is clearly huge potential to help them to increase their fitness level, and feel in more control of their lives. By developing multi-generational exercise opportunities, such as relay teams, involving younger family members, older people, with their knowledge and expertise could also mentor younger generations in a less formal way. Muscular strength, power, quality and endurance can be separately measured and recent evidence confirms the importance of strength training(40) in enabling older people to lead a full active and independent life. They can substantially increase their strength and power after repetitive exercise training (weights, or resistance). There are studies examining the relationship with age, exercise and balance for those at risk (osteoporotic women, frail older adults, subjects with previous fall history). In a study of a group of women aged 65 or older, subjects completed 12 months of light duty weight training twice a week, with no endurance training. At the end of the year they performed significantly better on tests of mental processing ability. MRI scans of both groups shows that portions of the brain that control decision-making and other types of thinking were more active in the weight trainers. They stressed that rather than aerobic –style activity, lifting weights was a viable option. The impact of aerobic exercise training depends on the intensity; higher intensity may result in greater improvement in whole body insulin action. MET (metabolic rate) is a way of measuring intensity of exercise, with resting rate being 1 MET, walking 15 minute/ mile at 6.5 Met, and running at 8 minute miles at 9 MET. An increase of one MET led to a reduction by 17% of premature death(43) in a Finnish study of women (average age 52) with no known medical problems. Yet another study(44) explored the risk of death among both normal male subjects and those with cardiovascular disease, and found each 1-MET increase in exercise capacity conferred a 12 per cent improvement in survival. This study concluded that exercise capacity is a more powerful negative predictor of death among men than other established risk factors for cardiovascular disease. The concept of `high intensity interval training` (HIT)(45) is relatively new form of interval training – `all out`, eg 20-30 seconds of extreme effort that hurts. After a period of rest, it is repeated 4-5 times. High intensity interval training induces skeletal muscle metabolic and performance adaptations that resemble traditional endurance training despite the low total exercise volume. Dramatic molecular changes in the muscle cells were noted. However most HIT studies have employed ‘all out', variable-load exercise interventions. They may not be safe, practical and/or well tolerated by certain individuals and should not be undertaken without medical advice. Walking is a safe, accessible and low cost activity and known to have great potential to increase physical activity levels in sedentary individuals. Walking speed has been shown to predict `survival` in several studies. An Australian study of 1705 men aged 70+(46) found the mean walking speed was just over 2 miles per hour. But survival analysis showed that the older men who walked faster than 0.82 m/s were 1.23 times less likely to die than those who walked slower! When their walking speed was 3 miles (about 5 km) per hour or greater, none of the men had died. 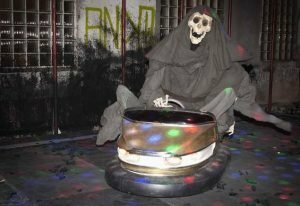 The researchers concluded that Grim Reaper’s preferred walking speed is 0.82 m/s (2.8k per hour. 1.87 mph) - for those wishing to avoid that fate then 3 mph would be the advised walking speed. One study(47) investigated the effects of a flexibility and relaxation programme, walking, and Nordic walking (NW) on walking speed, stride length, stride length variability, Parkinson-specific disability, and health-related quality of life over a 6-month study with 3 exercise sessions per week, each lasting 70 min. Assessment after completion of the training showed that pain was reduced in all groups, and balance and health-related quality of life were improved. Furthermore, walking, and Nordic walking improved stride length, gait variability, maximal walking speed, exercise capacity at submaximal level. No significant injuries occurred during the training! A large cohort of 1861(48) men and women born in 1920 and 1921 was followed up, exploring the statistics and causes of death and looked at the effect of exercise in people through to age 70 and then up to 88 years. 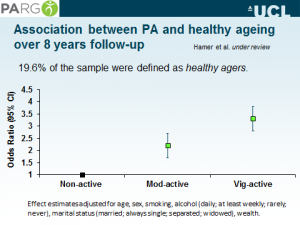 They found that even in this older population regular exercise had an impact on longevity and how well they functioned. Physically active people at 70 were more likely to be functioning independently. Even those who had begun with more sedentary lifestyles, but later became physical active had the benefits of living longer. They were measured again at 78yrs and those who remained sedentary were found to have a significantly higher risk of dying and crucially were at higher risks of losing the ability to function independently or being disabled by disease. Measured again at 88 yrs those who were physically active had again benefited, were living longer, and the physical activity had reduced the risk of their frailty. They had higher muscle mass, and lower excess body fat. However, the report cautioned that those who stopped exercising reverted to the same level of risks as those who didn’t exercise. Another encouraging study started in 1984(49) looking at 965 men and women around the age of 60, half of whom had been runners for an average of ten years. By 2005, with the study group, by now around 80 years old the running group were still exercising (though not necessarily running). They had significantly lower rates of death, disability and morbidity. Only 10% of the runners had died compared with 38% of the non-runners. This study also found that `it is never too late to start a healthier lifestyle`. Tanaka(50) an expert on ageing athletes commented `a great deal of the physical effects that we once thought was caused by ageing are actually the result of inactivity. In another study cohorts of older and younger adults were measured before and after strength training. Initially, the older adults were 59% weaker than younger, but after six months of training in older adults the strength improved significantly (such that they were only 38% lower than young adults(51). Similarly when elderly rats were given access to running wheels their leg muscles began sprouting new, hardy populations of satellite cells, suggesting that their muscles would now be able to build and repair themselves effectively. Increasing physical activity leads to significant reductions in coronary heart disease, strokes, Type 2 diabetes, cancer, mental health problems including dementia and falls. Targeting those adults who are significantly inactive (ie less than 30 mins per week) will produce the greatest reduction in chronic disease(52). One study(53) looked at 1741 English participants on a treadmill walking test who would attain or exceed vigorous intensity activity by walking at 3 mph. They concluded 1.5 million men and 3.9 million women (95% in England aged 25-64 years) could benefit in fitness and health terms from regularly walking at 3 mph. Regular physical activity also impacts on psychological wellbeing, self-esteem,(55, 56) improved mental health and social integration – i.e. `Enjoying life`. When centurions and other long lived individuals are studied they attribute their longevity to healthy lifestyle, exercising regularly, maintaining a social network and positive mental attitude(57). A recent study found(58) that uncontrolled high blood pressure and diabetes contribute to the loss of brain cells. Aerobic exercise protects the brain by building heart and artery resilience, which boosts blood flow to the brain. For many over 50’s, ageing is associated with a perceived loss of control over their lives. When measures of self-efficacy are used along with perceived competency, most well controlled exercise studies result in significant improvements in both physical fitness and self-efficacy, or sense of self-worth and ability to take control. There is also emerging evidence of significant psychological and cognitive benefits accruing from regular exercise participation by older adults(59) leading to reduced risk of dementia(60) or cognitive decline. It is thought to be the result of the impact of enhanced blood flow, and the increasing brain volume and improvements in the neuro - transmitter systems(61) and endorphins (although they require over 20 mins of exercising before they `kick in`, so it is not an instant gratification). There are however complicated inter-relationships in the variables. For example there is evidence(62) that optimistic women live longer, but these women also exercised more and were less obese! Older people who engage in regular physical activity reduce their risk of vascular-related dementia by 40 percent and cognitive impairment by 60 percent. These findings were based on a multinational European study that included annual full cognitive assessments of 639 people in their 60’s and 70’s for three years. Almost 64 per cent said they were active at least 30 minutes a day three times a week. The activity included gym classes, walking and biking(63). In a large study, 1740 persons older than age 65 years (without cognitive impairment, ie who scored above the 25th percentile on a Cognitive Ability Screening Instrument) were followed biennially to identify the presence of dementia. Six years later 158 participants had developed dementia and 107 had developed Alzheimer’s, results again showing that regular exercise was associated with a delay in the onset of dementia and Alzheimer disease(64). Other recent research found that three or more hours of average per day overtime of 10,000 civil servants leads to a stress and a 60% increased risk of coronary heart disease(65). Chronic stress, like depression can lead to an increase in smoking, drinking, sedentary lifestyle and chronic inflammation, all of which have impact on the workplace and economy. Stress has huge impacts on health but, with the right inspiration, motivation and support, exercise relieves stress, preventing the damaging chain-reactions unleashed by the build-up of stress hormones. An American study(67) assessed the effectiveness of an aerobic exercise program compared with anti-depressants for treatment of major depression in older patients, over 50 years. Patients were assigned randomly to a programme of aerobic exercise, anti-depressants or combined exercise and medication. This study found that antidepressants led to a more rapid initial therapeutic response than exercise, but after 16 weeks of treatment, exercise was equally effective in reducing depression among patients. But contradictorily programmes of prescribing a `dose` of exercise as a medicine, without some longer term follow up have low rates of sustained usage(68). More work needs to be done on finding ways of encouraging older participants to persevere with exercise, via more socially orientated regular opportunities to participate in various forms of sport and exercise. Crucially it needs to be sustained, and continue to offer new challenges, and ways of combatting social isolation. A Canadian strategy(69) offers a month of gym-based activity, encouraging physicians to give one of five options according to fitness levels, as a written prescription with steadily increasing duration and intensity and then follow up. Ongoing physician monitoring was found to have authority and lead to greater compliance if the doctors’ orders are explicit and in writing, especially for patients not in the habit of exercising. Research they say has shown that written prescription motivates patients to pay attention, retain the information and return for follow up visits. The study suggests an expansion of health care teams to include an exercise physiologist trained to design programmes for healthy patients and those with chronic conditions. A recent UK small study replicated the findings of greater compliance with GP `prescription`(70). A combination of aerobic activity, strength training, and flexibility exercises, plus increased general daily activity can reduce medication dependence and health care costs while maintaining functional independence and improving quality of life in older adults. However, patients often do not benefit fully from exercise prescriptions because they receive vague or inappropriate instructions. Effective exercise prescriptions include recommendations on frequency, intensity, type, time, and progression of exercise that follow disease-specific guidelines. Changes in physical activity require multiple motivational strategies including exercise instruction as well as goal-setting, self-monitoring, and problem-solving education. Helping patients identify emotionally rewarding and physically appropriate activities, contingencies, and social support will increase exercise continuation rates and facilitate desirable health outcomes. Through patient contact and community advocacy, physicians can promote lifestyle patterns that are essential for healthy aging(71). Recent surveys on inactivity, sedentary lifestyle(72) reveals challenges in creating motivation, goal setting(73). Older people want to do more exercise(74). A survey of Age UK found that only half of over 55’s were doing the recommended 2.5 hours of and 1 in 8 were not doing any exercise at all. One In four people in England would become more active if their doctor or a nurse advised them to. Gamesmakers working with the Olympic training schemes four that where Identity cards to be stamped the compliance was greater. The Leics Challenge web based tool also able to monitor regularly and use to effect. `A great deal of the physical effects that we once thought were caused by ageing are actually the result of inactivity`(76). Satellite cells are specialised cells that help to repair and regenerate muscle tissue, and in older inactive rats, their leg muscles contained far fewer restorative satellite cells than those of young rats. But when they were given access to running wheels their leg muscles began sprouting new hardy populations of satellite cells. A German study noted a key aspect of their older runners and commented(77), `it is striking to see in our study that many of the middle-aged athletes looked much younger than sedentary control subjects of the same age.’ However, even more striking was what was going on beneath those deceptively youthful surfaces in their white blood cells. Another study with mice(78) discovered that exercise kept mice from becoming grey prematurely and reduced or eliminated almost every detrimental effect of aging in the mice that had been genetically programmed to grow old at an accelerated pace(79). Positioned at either end of chromosomes, telomeres are strands of nucleotides that serve the function of locking the ends of the chromosomes they are attached to. This locking helps protect the chromosome from deteriorating. They are a measure of cell age and, thus, health. There is mounting scientific evidence that shorter telomeres are associated to a higher risk of developing cardiovascular disease and may be associated with the development of certain neurological diseases such as Alzheimer’s(80). When cells divide and replicate these long strands of DNA, the telomere cap is snipped, a process that is believed to protect the rest of the DNA but leaves an increasingly abbreviated telomere. Eventually, if a cell’s telomeres become too short, the cell either dies or enters a kind of suspended state – that is ageing. 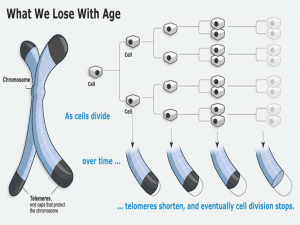 Most researchers now accept telomere length as a reliable marker of cell age. The longer the telomere, the longer the cell’s life. The more long telomeres we have, it is suggested the longer we’re likely to live. In another study(82) people were tested for their white blood cells’ telomere length and their V02 max — (VO2 max is a maximum aerobic capacity, a widely accepted measure of physical fitness - larger respiratory volume allows more oxygen to be diffused into the blood flow). In subjects aged 55 to 72, a higher V02 max correlated closely with longer telomeres. The fitter a person was in middle age or onward, the younger their cells. A third study, analysed data from 251 healthy, non-smoking women ages 50-65 of varying activity levels. The findings showed that non-exercising women with histories of childhood abuse had shorter telomeres than those with no histories of abuse. But, in those women who exercised regularly, there was no link between childhood abuse and telomere length, after controlling for body mass index, income, education and age. “We saw a relationship between childhood trauma and short telomere length but the relationship seems to go away in people who exercise vigorously at least three times a week,” UCSF scientists(83) reported several studies showing that psychological stress, trauma and chronic stressful life events lead to shorter telomeres. But those findings also suggest that exercise may prevent this impact of stress-related damage to the telomeres. Shorter telomeres are associated with a broad range of aging-related diseases and are predictive of incidence and poor prognosis of cardiovascular disease and a variety of cancers. But physical activity may moderate this impact(84). Neurogenesis – new brain neurons. Pioneering animal studies(88) first showed that brains of athletic mice showed 2-3 times more neurogenesis (creation of new neurons) than the non-exerciser mice. Subsequent studies of the human brain showed that it was not only capable of renewing itself but that exercise speeded the process. Finally and significantly experiments with socially housed rats produced copiously more new brain cells when they exercised than solitary rats(89). Canadian researchers measured the energy expenditure and cognitive functioning of a large group of elderly adults over the course of two to five years. Most of the volunteers did not exercise, per se, and almost none worked out vigorously. Their activities generally consisted of “walking around the block, cooking, gardening`. But even so, the effects of this modest activity on the brain were remarkable. While the wholly sedentary volunteers scored significantly worse over the years on tests of cognitive function, the most active group showed little decline. About 90 percent of those with the greatest daily energy expenditure could think and remember just about as well, year after year(90). Walking and other light activity had, the researchers concluded, bought five years of better brain power. Finally(91) an animal study found that the stress reducing changes in the brain were not immediately in evidence, but the molecular brain changes occurred between 3-6 weeks after starting exercise. Mitochondria- the powerhouse of cells. Mitochondria convert food fuel into energy forms that can be used by muscles. When a muscle starts to contract the mitochondria within the muscle cell burn the carbohydrates / use either the sugar in the muscles (glycogen) or the sugars in the blood stream to make ATP. Contracting muscles rely on ATP, a specialised molecule that provides energy. ATP is created by mitochondria. Increased numbers of mitochondria (the cells powerhouse) means an increase in the rate of energy production. The muscles, bones and ligaments also become stronger to cope with the additional loads and impact put through them. The amount of myoglobin within skeletal muscle increases, which allows more oxygen to be stored within the muscle, and to supply the mitochondria. Mitochondria have their own DNA, distinct from the cell’s own genetic material, and they multiply on their own. But in the process, mitochondria can accumulate small genetic mutations, which under normal circumstances are corrected by specialized repair systems within the cell. Over time, as we age, the number of mutations begins to outstrip the system’s ability to make repairs, and mitochondria start malfunctioning and dying. As resident mitochondria falter, the cells they fuel wither or die. Muscles shrink, brain volume drops, hair falls out or loses its pigmentation, and soon enough we are, in appearance and beneath the surface, old. Effectively mitochondria transform energy from food into cellular energy. Exercise increases the number of mitochondria, improving the body's ability to produce energy. In other words, the more mitochondria we have, the more energy we can generate during exercise and the faster and longer you can exercise. 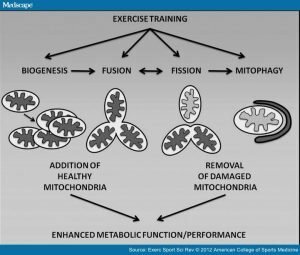 Exercise promotes biogenesis, fusion, fission, and mitophagy in an effort to promote the formation of new mitochondria and the identification and removal of damaged and dysfunctional mitochondria to improve metabolic function. While mitochondria exist in most cells, the amount present in skeletal muscle is especially important. However, the total number of mitochondria present in the body tends to decrease with age. In another study researchers found that exercise in older adults increased the number of mitochondria present. In both men and women with an average age of 67 years, regular exercise significantly increased mitochondrial content, indicating that exercise is a realistic and practical way to increase energy and endurance in both younger and older adults. In a study, mice were used(92) that lacked the primary mitochondrial repair mechanism, so they developed malfunctioning mitochondria early in their lives, as early as 3 months of age, i.e. the human equivalent of age 20. By the time they reached 8 months, or their early 60’s in human terms, the animals were extremely frail and decrepit, with spindly muscles, shrunken brains, enlarged hearts, shriveled gonads and patchy, greying fur. Listless, they barely moved around their cages. All were dead before reaching a year of age. But in contrast, when comparing with the mice that exercised. `Half of the mice were allowed to run on a wheel for 45 minutes three times a week, beginning at 3 months. These rodent runners were required to maintain a fairly brisk pace, “It was about like a person running a 50- or 55-minute 10K.” The mice continued this regimen for five months. At 8 months, when their sedentary lab mates were bald, frail and dying, the running rats remained youthful. They had full pelts of dark fur, no salt-and-pepper shadings. They also had maintained almost all of their muscle mass and brain volume. Their gonads were normal, as were their hearts. They could balance on narrow rods, `the showoffs`. The researchers concluded that the most remarkable, although they still harbored the mutation that should have affected mitochondrial repair, the exercising mice had more mitochondria overall and far fewer with the mutations that the sedentary mice had. At 1 year, none of the exercising mice had died of natural causes. Whilst researchers had known from previous studies that exercise would affect mitochondrial health in muscles, including the heart, they had not expected that it would affect every tissue and bodily system studied. In an untrained human muscle, resistance exercise increased both muscle and mitochondria. However, after 10 weeks of training, only the muscle growth continued while the number of mitochondria remained constant. This study indicates that resistance exercise can stimulate increased mitochondrial concentrations to a certain extent in an untrained athlete. Endurance training stimulated a 154 percent increase in mitochondria after the first workout. After 10 weeks of training, the number of mitochondria continued to increase at a slower rate of 105 percent. The study was only performed for 10 weeks, but the study observed that after the initial spike, the mitochondria continued to increase with endurance exercise but at a slower rate. This research indicates that while both anaerobic and aerobic exercise contribute to muscle and mitochondrial formation, only aerobic exercise continuously increases the number of mitochondria present in the cells. There is a huge body of research concluding that the food we eat impacts on the risk of chronic disease(93). `we are the food we eat` - food is believed to account for roughly 35-60% of cancers, including cancers of the stomach, colon, liver, prostate, breast, uterus, and ovary(94). There is substantial agreement that a `Mediterranean diet` of fruit, vegetables, beans, whole grains, fish low in saturated fat and only small amount of dairy and meat leads to a reduction in obesity, high blood pressure, coronary heart disease, several cancers, diabetes, Alzheimer’s and the risk of premature death. Healthy diets not only help prevent cancer, but research evidence suggests patients with a healthy diet also survived after the occurrence of cancer. A study(95) followed nearly 2,500 postmenopausal women with breast cancer for five years after treatment. They found those who ate fruit and veg diet, or exercised had less risk of re-occurrence of their cancer. But if they ate fruit and veg and exercised their risks of re-occurrence were halved. A high fibre diet has also related to decreased re-occurrence for women recently treated for breast cancer(96). In summarising reports from the American cancer(97) project, girls born now have a one in three risk of cancer, boys a one in two. 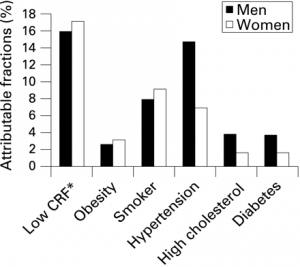 Lifestyle factors, smoking, exercise and diet are the major influence, NOT genetics. Meat eaters with associated increased hormone levels have more colar-rectal cancer and those eating dairy products a higher risk of prostate cancers. Another study examined the association between the Mediterranean diet and Alzheimer disease(98). 194 patients with Alzheimer’s were compared with 179 non-demented patients found a higher adherence to the Mediterranean diet was associated with lower risk for Alzheimer’s disease. Recently(99) leading UK doctors attending a G8 summit on dementia argued that the battle against dementia should focus on the benefits of Mediterranean diet of fish, olive oil, vegetables and fruit rather than `dubious` drugs(100) and quoted a review of 12 studies, which found a higher adherence to a Mediterranean diet was associated with better cognitive function, lower rates of cognitive decline and a reduced risk of Alzheimer’s disease. Older adults eat on average 4.4 servings of fruit and vegetables daily, and 37% meet national guidelines of 5 per/day (compared with 30% in younger age group)(101). In a study of women in their 70’s, those who were the most physical active and had the highest consumption of fruits and veg were eight times more likely to survive the five year follow up than women with the lowest rates(102). Osteoporosis and sarcopenia are degenerative diseases frequently associated with aging(103). The loss of bone and muscle results in significant morbidity, so preventing or attenuating osteoporosis and sarcopenia is vital. Dietary protein is crucial for development of bone and muscle. Several epidemiological and clinical studies point to a beneficial effect of protein intakes above the current recommended daily allowance (RDA) (0.8 g/kg per day) for adults aged 19 and older. There is evidence that the anabolic response of muscle to dietary protein is attenuated in elderly people, and as a result, the amount of protein needed to achieve anabolism is greater. Dietary protein also increases circulating insulin-like growth factor, which has anabolic effects on muscle and bone. Furthermore, increasing dietary protein increases calcium absorption, which could be anabolic for bone. Since nutritional studies show that many elderly individuals eat less protein than the average person, researchers have reasoned that if the elderly simply increased their protein intake, they might slow down muscle loss. A newly published study(104) suggests that a diet containing a moderate amount of protein-rich food such as beef, fish, pork, chicken, dairy or nuts may help slow the deterioration of elderly people's muscles and that older bodies are just as good as young ones at turning protein-rich food into muscle. AGE UK report that 23% of people over 65 said they had restless sleep on most or every night in the last two weeks. This was higher than the 8% of young people. 45% of over 65’s said they had never had restless sleep. The National Sleep Foundation recommends that adults get 7 to 9 hours a night. The significance of sufficient sleep hours is being recognised(105) and a deficit linked with Diabetes and associated health issues(106). Sleep is a vital physiological process with important restorative functions. But notable qualitative and quantitative changes in sleep occur with age. Moreover, many sleep-related disorders occur with increasing frequency among elderly people. Severe disturbances may lead to depression, cognitive impairments, deterioration of quality of life, and significant stresses for carers and increased healthcare costs. The most common treatment for sleep disorders (particularly insomnia) is pharmacological. The efficacy of non-drug interventions has been suggested to be slower than pharmacological methods, but without the risk of drug-related tolerance or dependency. 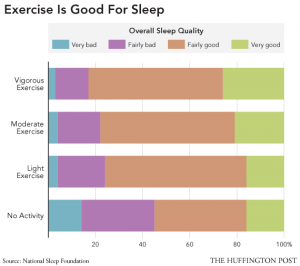 Physical exercise, taken regularly(107), may promote relaxation and raise core body temperature in ways that are beneficial to initiating and maintaining sleep. 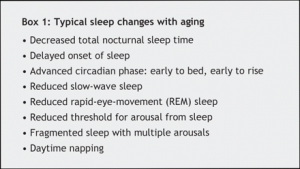 A Canadian study(108) described ageing as associated with several well-described changes in patterns of sleep. Typically, there is a phase advance in the normal circadian sleep cycle: older people tend to go to sleep earlier in the evening but also to wake earlier. They may also wake more frequently during the night and experience fragmented sleep. The prevalence of many sleep disorders increases with age. Insomnia, whether primary or secondary to co-existent illness or medication use, is very common among elderly people. Rapid eye movement (REM) sleep behaviour disorders are frequently not considered for this population. Periodic leg-movement disorder and restless legs syndrome are diagnosed clinically. Snoring is a common sleep-related respiratory disorder; so is obstructive sleep apnea, which is increasingly seen among older people and is significantly associated with cardio-and cerebrovascular disease as well as cognitive impairment. An America study(109) identified a link between sleep disturbance and depression; they also had results clearly indicating that increasing age was associated with an increased prevalence of sleep problems. Insomnia, hypersomnia, and all sleep problems increased from age 50–59 years to age 80 years and older. The prevalence’s were between 20% and 40% for insomnia. 11 CONCLUSIONS & A NEW SILVERFIT LIFESTYLE? There is overwhelming research evidence of the benefits of a changed and healthier lifestyle, taking on board the magic formula of good nutrition, no smoking, regular exercise and reduced obesity, with only moderate alcohol consumption and a social network. Given the dramatic emergence of the obesity epidemic, it is similarly clear that the risks and costs are higher for the Over 50s, both for the individual and for society, with the younger generation forced to pay the ever increasing cost of their unhealthy or dependent elders. The least active members of our population are the least fit and healthy. If we are aiming for `successful ageing and quality of life` then we need to find ways of overcoming the blocks to the Over 50’s in embracing healthier lifestyles, encouraging them to seek the benefits of aerobic and resistance exercise, and seizing the opportunities to reduce the rate of initial and subsequent falls. However there are commercial and political influences opposing living a healthier lifestyle. The power and marketing budgets of the junk food industry, the drinks industry, and the meat industry are huge and appear to influence overall media coverage. Moreover a costly focus on screening, rather than prevention, for cholesterol, blood pressure etc leads to a ‘solution` via the pharmaceutical industry. Pills though do not tackle all the underlying causes of Type 2 diabetes. High blood pressure etc. Greater funding for prevention and working out ways to overcome the blocks to a healthier lifestyle could be far more advantageous. b. Opportunities for arts – Creative activities include: arts and performance (writing, painting, sculpture, photography, music, poetry, drama, dance, circus, film); libraries; museums; heritage; and cultural tourism. g. A time bank is a ‘virtual’ bank where people can deposit the time they spend helping each other and withdraw that time when they need help themselves. Everyone’s time is of equal value and transactions are facilitated and recorded by a time broker. Some studies have shown that time banking is more successful at reaching those on low incomes/areas of deprivation than traditional volunteering(110). Exercises on Referral Schemes, or Exercise on Prescription Schemes are usually partnerships between Public Health and Leisure Services. A recent Govt. announcement(111) said that aerobics, weight training, yoga and swimming would be available either free or at cut-price rates for up to ten weeks at a time under the new schemes, 300 of which schemes are already up and running. Schemes generally consist of a referral by a primary care clinician to a tailored programme of increased physical activity. A fitness test usually precedes a time-limited (10- 12 week course) or free admission to leisure centres for swimming. Current research indicates however that exercise referral schemes have only a small effect on increasing physical activity in sedentary people(112). The key challenge, if future exercise-referral schemes are to be commissioned by the NHS, is to improve adherence by addressing the barriers. There were positive effects on depression and anxiety but the economic evaluation demonstrated that although motivational interviewing (MI) and goal setting were key, less evidence was found about their effectiveness(113). The bases for referrals were random, and the cost at per QALY of £12,111 was high. For those who adhered to the full programme there wass a marginal cost saving (£-367 per QALY). Other early anecdotal findings are that, time limited schemes rarely contain a social element and fixed hourly time slots are constraining. Only a fifth of patients who have already taken part in the schemes went on in one scheme to join their gyms after their prescriptions ran out. The newly (Dec 2013) announced scheme is expected it to cost £60,000 per 800 patients, with the funding shared between health authorities, councils and leisure companies. Department of Health issued guidance on exactly what exercise they could prescribe for patients and addressed concerns expressed by GPs over insurance cover and legal responsibility for their patients in the gym. 'The NHS is there to help people get well and stay well. Prevention is better than cure. There is a lot of evidence that moderate exercise brings with it health benefits and in the longer term it may mean fewer people need treatment for a disease or illness. Significantly there was no evidence of schemes structured to contain a social element. The Olympic Legacy should also offer a platform for motivation, inspiration, media coverage and a new range of realistic motivating goals that are acceptable to over 50’s. And there is evidence that INSPIRE 2012 are considering the Legacy for older people. We believe that, with partners such as Leisure providers and the Olympic legacy, the Mayor’s office and the support of other charities, corporates and statutory agencies, Silverfit can find more find fun, sociable ways to motivate permanent change in lifestyles with an expanding range of sociable activities and sporting events for 2013 and beyond. Ways must be found to demonstrate a way forward, motivating, offering the individual counselling, enabling fitness tests and measuring goals in GP practices, including providing opportunities for volunteering at events and activities that encourage 50 year olds to get fit NOW. 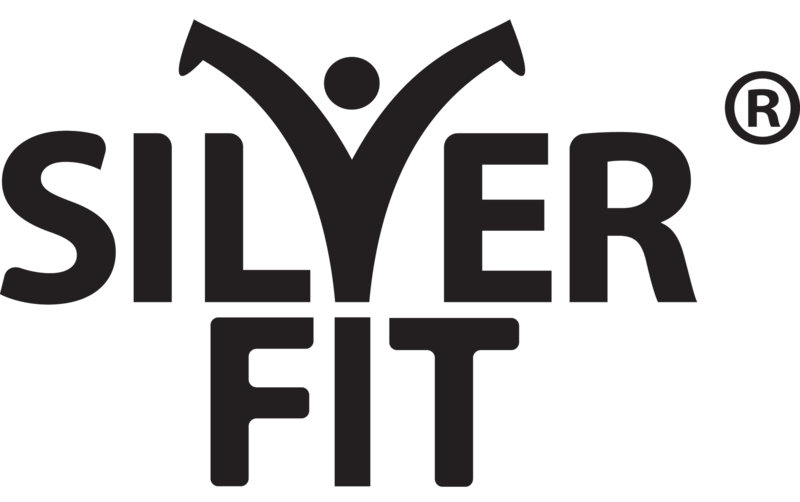 Silverfit is responding to the need, and setting up regular Silver Tuesday training sessions, offering a range of physical activities and encouraging the development of new, more active social networks. The recipe is simple –meet-up in a café, go off for an hour of planned activities (from according to location opportunities walking to running, swimming to water aerobics, cycling, yoga, Pilates or T’ai Chi) and meet back again to swap experiences, goals, and have fun with new more active social networks. SILVERFIT believe that it is essential that all socially prescribed activities are underpinned by opportunities for social interaction to combat social isolation whilst exercising. Concluding, the expansion of any [email protected]+ project needs to be inspired and sustained by older people, not be imposed on them. Silverfit will capitalise on increased use of web-based information, the rise of social networking, and growing sense of social awareness together with a greater focus on finding ways to fitter lifestyles and reducing inequalities of healthy ageing. Moore SC, et al. Leisure Time Physical Activity of Moderate to Vigorous Intensity and Mortality: A Large Pooled Cohort Analysis. PLoS Medicine. November 6, 2012. doi: 10.1371/journal.pmed.1001335. Agency for Healthcare Research and Quality. Centers for Disease Control and Prevention. Physical activity and older Americans: benefits and strategies. June 2002. Accessed March 15, 2006, at: http://www.ahrq.gov/ppip/activity.htm. & Pratt M, Macera CA, Wang G. Higher direct medical costs associated with physical inactivity. Phys Sports Med. 2000;28:63–70. Katz, D (2009) Life and Death, Knowledge and Power: Why Knowing What Matters Is Not What's the Matter . Arch Intern Med. 2009;169(15):1362-1363. Martin, C. (2009) Exercise Dose and Quality of Life - A Randomized Controlled Trial . Arch Intern Med. 2009;169(3):269-278. Gulati, M et al (2003) Exercise Capacity and the Risk of Death in Women -The St James Women Take Heart Project - (Circulation. 2003; 108:1554.) © 2003 American Heart Association, Inc.
B Michel BA, Lane NE, Bjorkengren A, Bloch DA, Fries JF. Impact of running on lumbar bone density: a 5-year longitudinal study. J Rheumatol. 1992;19:1759-63. Nelson ME, Fiatarone MA, Morganti CM, Trice I, Greenberg RA, Evans WJ. (1994) Effects of high-intensity strength training on multiple risk factors for osteoporotic fractures. A randomized controlled trial. Petrella RJ, Cunningham DA, Paterson DH. Effects of 5-day exercise training in elderly subjects on resting left ventricular diastolic function and V˙O2max. Can J Appl Physiol. 1997;22:37-47. Reuter et al (2011) effects of a flexibility and relaxation programme with walking and Nordic walking on Parkinson’s disease. ( Aging Res. Epub 2011 Mar 30. Seeman TE, Berkman LF, Charpentier PA, Blazer DG, Albert MS, Tinetti ME. Behavioral and psychosocial predictors of physical performance: MacArthur studies of successful aging. J Gerontol A Biol Sci Med Sci. 1995;50:M177-83. Spirduso WW, Francis KL, MacRae PG. Physical Dimensions of Aging. Champaign (IL): Human Kinetics; 2005. Blumenthal et al (1999) Effects of Exercise Training on Older Patients With Major Depression Arch Intern Med. 1999;159:2349-2356. ANN YELMOKAS MCDERMOTT, PH.D., M.S., L.N., and HEATHER MERNITZ, M.S., Jean Mayer U.S. Department of Agriculture Human Nutrition Research Center on Aging at Tufts University, Boston, Massachusetts. Am Fam Physician. 2006 Aug 1;74(3):437-444. Nikolaos Scarmeas et al (2006) Mediterranean Diet, Alzheimer Disease, and Vascular Mediation Neurol. 2006;63:1709-1717.